Tick Tock Worker cannot be used as FVG. Tick Tock Worker is restricted to 1. This means you can not choose Tick Tock Worker as starter and you can only run him once in your main deck. Cat Butler can be ran at 4 again. These changes are not for the English card game until further notice. This means Bushiroad watches their “performance” in tournaments and then decides to restrict them or not (usually not). 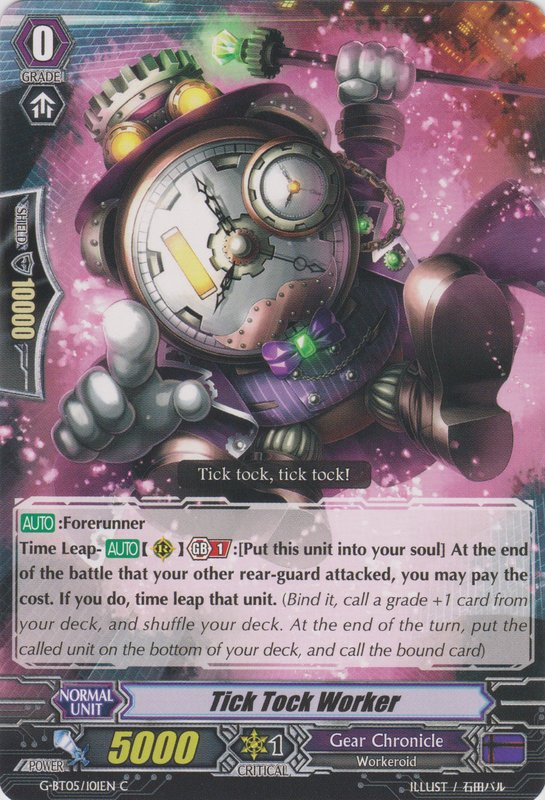 ※ By combining it with certain cards that make use of the repeat use of 【Time Leap】, you can increase the number of times you attack, such that it’s caused the strategy of 《Gear Chronicle》 Decks to be done in only one way. It’s over used in Special G Regulation and Clan Fight games, and since we’ve judged it to have an undue influence on the metagame, we’re restricting its ability to be used as a First Vanguard along with the number of copies you can run. ※ By combining it with certain cards, you may be able to use its ability multiple times in one turn, such that it may cement 《Gear Chronicle》 Decks to be played in a cemented uniform manner, so since it might affect the metagame, it’s a card we plan to keep a close eye on once those ‘certain cards’ arrive. ※ With an ability to place cards in the Damage Zone during your opponent’s turns as well as its interactions with other cards, it can increase the hand along with the ability to raise the defensive Power of your Vanguard, so since we think it might impact the metagame, we plan to keep a close eye on this card. ※ We’ve decided to unrestrict this card due to the fact “Legion” has very little bearing on the current game enviornment.